Acro - Acro is based on a combination of gymnastic skills, contortion, and dance. Warm up consists of core work, strength, and toning exercises. Beginners learn basic gymnastics skills that are further developed as they advance. Once students master a skill they will then move on to more difficult level of tumbling. Flexibility skills will be taught and routinely gone over until each individual student has mastered each skill. Ballet​ - Ballet is the foundation of many other forms of dance. It provides grace, poise and technique needed in the other dance genres, and therefore it is important for all serious dancers. Ballet is based on techniques that have been developed over centuries. Classes will help dancers with posture, flexibility, turnout, dance terminology, and ballet positions. Dancers begin class at the barre, then move to the center floor work and end class with across the floor combinations. Contemporary - Contemporary dance is a style of expressive dance that combines elements of several dance genres including modern, jazz, lyrical and classical ballet. Contemporary dancers strive to connect the mind and the body through fluid dance movements. Contemporary dance stresses versatility and improvisation, unlike the strict, structured nature of ballet. Contemporary dancers focus on floorwork, using gravity to pull them down to the floor. This dance genre is often done in bare feet. Contemporary dance can be performed to many different styles of music. Ballet must be taken in order to participate in our contemporary classes. Creative Movement - Creative Movement introduces our very youngest dancers (ages 3&4) to a structured environment while allowing them to enjoy learning the basics of ballet and tap. Socialization skills such as turn-taking and following instructions will be emphasized. In addition they will explore movement qualities, musicality, practice gross motor coordination and work on simple locomotion, enhancing the development of both their bodies and their minds! Creative and fun games, stories and imaginative exercises will send them home happy and invigorated. This class only performs one recital dance while allowing dancers the benefit of learning two dance genres at a novice level. Jazz - Jazz is a fun and energetic dance genre that combines the techniques of classical ballet and modern dance with current forms of pop dance. It uses dramatic body movements, including isolations and contractions of specific body parts to the movement of the entire body. There are many styles of jazz including; street, Broadway, contemporary, and lyrical. Class includes proper warm-up, stretches, isolations, across the floor progressions and combinations usually done to popular music. Ballet must be taken in order to participate in our jazz classes. 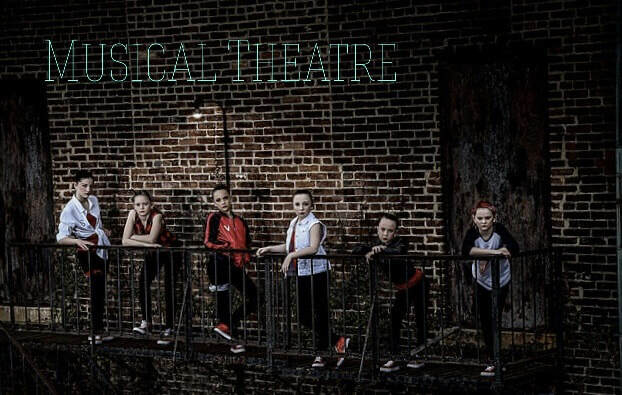 Musical Theater - Musical Theater focuses on learning proper dance technique while exploring the dance styles used on Broadway. Performance skills such as connecting with the audience and telling a story through dance and facial expressions are emphasized. This a fun genre for the dancer who loves to be on the stage. Modern-a free, expressive style of dance started in the early 20th century in reaction to classical ballet. Modern dance focuses on the dancer’s own interpretation instead of structured steps, contractions, spirals, basic floor work, and concepts of space, time, and force. Pas de Deux - Pas de Deux is advanced ballet partnering. The course covers pas de deux basics in supported turns, lifts, and couple ensembles. Classes are designed primarily to build students core strength and confidence while manipulating, lifting and supporting each other in a kinetic relationship. Classical as well as improvisational material will be presented thus introducing students to the challenges that come with sharing weight and gracefully dancing with others. Students are only able to participate in Pas de Deux by teacher invitiation. Pointe - Dancing on pointe is the act of standing on the tips of the shoes while performing ballet. Special shoes with hard toes and stiff shanks are required. Dancing on pointe requires strength and skill, and therefore is for the more advanced ballet students. Students will work at the barre on strengthening exercises as well as in center. Instructor permission is required before starting pointe and two weekly ballet classes are required to be taken in order to participate in our pointe classes. Pre-Ballet/Tap - Pre-Ballet/Tap is designed for the beginner level dancer ages 4 & 5. Students learn the basics of classical ballet and the fundamentals of tap during an hour long class. This class is taught in a fun and creative way, so as to develop a life-long love of dance. Pre-Ballet/Tap students perform two dances in the recital and therefore must purchase two recital costumes. 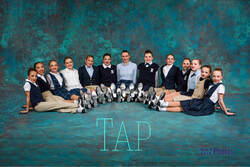 Tap - Tap dancing is a form of dance in which dancers wear special shoes equipped with metal taps on the toes and heels. Dancers use their feet to create rhythmic patterns and beats transforming the dancer into a percussive musician. Musicality is emphasized in tap by teaching the dancer to find rhythm and beats not only in the music but in their own bodies.